You’ve heard the stories about traveling the world on points and miles, staying in exotic hotel suites, and flying first class. And now you’ve decided it’s time to get your fair share of this fantasy lifestyle. The first question you might ask is which rewards-earning credit card is the best credit card for beginners? There is no one right answer, as the best rewards-earning and cash-back credit cards for you will depend on your travel goals and financial situation. You don’t want to end up with travel rewards you can’t use, and although you can always use cash-back, you’ll want a strategy in place to maximize this new influx of capital to your bottom line. You also don’t want to start applying for credit cards and get denied, so some preparation is necessary. You’ll want to learn about where you stand now and where you need to be credit-wise to qualify for rewards-earning credit cards. It may sound like a lot to learn, but we’ve got you covered. We’ll cover all the information you need to research your credit history, tips for finding the right credit cards that help you realize travel or lifestyle goals, and our recommendations for the best starter credit cards for travel rewards and cash-back. Where Can Your Rewards Take You? Everyone should know their credit score because poor credit can impact your life negatively and excellent credit can give you options for improving your life. To secure the best rewards-earning credit cards, for example, you’ll need excellent credit, so you’ll want to know where you stand before you apply. Credit scores are depicted numerically from 300 to 850. Sources vary, but generally, a score in the 750 range is considered excellent. First, accessing your credit score shouldn’t cost you, as you can get it for free from several sources. Credit Karma and Credit Sesame are two websites you can use to access your credit score. You will not be charged to access your score at either of these sites. You can learn more about how to view your credit score for free and how your credit score is determined by checking out our expert guide. Creating travel goals is an important step to making sure you’re earning the right rewards that can be redeemed for the travel you want. Image courtesy of Shutterstock.com. Once you know your credit score and are reasonably sure you can qualify for a rewards-earning credit card, you’ll want to zero in on the travel goals you’d like to realize. Want to fund an annual family vacation, see the Great Pyramids of Egypt, or explore Australia for a month? All of these and more are possible, but you need a plan to accumulate rewards that can be used to make that trip a reality. If you want to plan a family vacation to Hawaii, for example, a cash-back credit card alone is probably not going to get you there. But it can help cover some portion of the trip. Perhaps a certain airline flies direct from your home airport to Hawaii, and that’s the airline you prefer to fly. You may want to have a credit card that earns flexible rewards that can either be transferred to that airline or used to offset the cash cost of the flight on that airline should the flights go on sale. It’s important to earn rewards that you can use. Creating travel goals upfront can help ensure that. Bottom Line: Having a large stash of rewards that can’t be redeemed for what you want is not the worse situation, but it’s better to be sitting in paradise having redeemed those rewards for your dream trip. There are 5 basic questions you should answer and seek answers before selecting a rewards-earning credit card. The answers can help you determine if you’re ready for a rewards-earning credit card and if a particular card is right for you. 1. Can I pay off the balance each month? If you’re not able to pay off the balance each month on your rewards-earning credit card, the interest charges will negate the value of any rewards you receive. If you don’t plan to pay off the balance each statement period, it’s best to not pursue such a card. 2. Am I comfortable paying an annual fee? There are plenty of no annual fee rewards-earning credit cards, so there is no need to compromise if don’t want to pay an annual fee. Answering no to this question, however, will narrow the list of rewards-earning cards you can consider. 3. Is there a sign-up bonus or benefits that I can use that would offset the cost of that annual fee? Premium rewards-earning credit cards come with high annual fees. They also come with statement credits, lounge access, airline or hotels perk, elite status, free internet access, and many additional benefits that can more than offset the cost of an annual fee. You’ll want to review these benefits and determine how many you’ll use. 4. How do I earn rewards? This is important information you’ll need to select a credit card with bonus spending categories that match your spending habits. For example, if you’re considering a credit card that earns 3x points on travel and you’re not a frequent traveler, you won’t maximize the value of the card. 5. How do I redeem rewards? If you’re earning cash-back on a credit card, can you only redeem the cash-back for travel purchases, is the cash-back applied automatically to your statement each month, or can you request a check be sent to you? Do you get the most value for your rewards points by redeeming them on the credit card issuer’s travel site? Knowing the best way to redeem your rewards is paramount to getting the most value from your card. Bottom Line: You may be tempted to grab a rewards-earning card because it’s promoted as the best credit card available, but it may not be the best credit card for you. It doesn’t take a lot of research to discover if a particular card is a fit when you review the attributes of it and answer the basic questions. No matter your travel goals, a well-managed rewards-earning credit card can deliver experiences you might not have otherwise. Image of Rabbit Island, Hawaii by Christine Krzyszton. Let’s review some of the best starter travel and cash-back rewards credit cards and give you the low down on annual fees, the benefits for beginners, how you earn rewards, and of most importance: how you redeem those rewards. The Chase Sapphire Preferred® is a great vehicle to start accumulating Chase Ultimate Rewards Points, some of the most valuable rewards points you can earn. You’ll also receive a generous sign-up bonus after meeting initial spending requirements. You can redeem Ultimate Rewards for travel via the Chase Ultimate Rewards travel portal or transfer points to airline and hotel partners. You can also redeem points to shop on Amazon to purchase gift cards. The Chase Sapphire Preferred® has long been the standard as one of the best starter credit cards because Chase Ultimate Rewards Points are flexible travel rewards that have tremendous value. Don’t be deterred by the annual fee on the American Express® Gold Card as the earning potential far outweighs the cost. The card earns big at supermarkets and restaurants, two categories in which you’re probably already spending. Plus it doubles as a travel rewards card earning big on airline tickets and at American Express Travel. Membership Rewards Points can be redeemed for travel, gift cards, merchandise, or entertainment. The best value per point can be realized when transferring points to select airline or hotel partners. The Chase Freedom Unlimited has a simple rewards-earning and redemption structure that is easy to navigate. Plus, it’s a good starter card that can partner with premium Chase credit cards (cards that carry an annual fee) for greater redemption value. The card also comes with a 15-month 0% APR period for purchases and balance transfers, a benefit that helps you extend debt repayment without incurring interest charges. Receive 1.5% cash-back on every purchase; it’s as simple as that. Rewards are earned in the form of Ultimate Rewards Points that can be turned into cash, redeemed on Amazon for gift cards, or for travel at the rate of 1 cent per point. The Ultimate Rewards Points you earn on the Chase Freedom Unlimited® Card increase in value when transferred to a premium Chase card. These premium cards include the Chase Sapphire Preferred®, Chase Sapphire Reserve® Card, and Ink Business Preferred℠ Credit Card, because they can be redeemed for up to 50% more towards travel, or transferred to airline or hotel partners. If you’re not a frequent traveler (the card does charge a foreign transaction fee) and want a rewards-earning credit card with simple earning and redemption, the Chase Freedom Unlimited may be a fit as the best starter card for you. Bottom line: The Chase Freedom Unlimited® with no annual fee is great for earning valuable Ultimate Rewards Points on every purchase, and this is why it makes our list of recommended starter cards. When it comes time for redemption, however, you’ll want to partner the card with a Chase premium credit card to receive as much as 50% more value. Are you buying groceries, gas, and school clothes without earning rewards? If so, that’s a lot of purchases each year not earning rewards that could help you get closer to your travel goals. The Blue Cash Everyday® Card from American Express will change all that because it rewards those everyday purchases with cash-back. The Blue Cash Everyday Card from American Express is one of the best starter cards because its everyday bonus categories for earning cash-back probably match up with purchases you’re making anyway. You’ll earn a sign-up bonus statement credit after reaching minimum spending levels, usually in the first 3 months. If you have an upcoming large purchase or need to transfer high-interest credit card balances, the 15-month 0% period can save you plenty on interest charges. Cash-back can be redeemed for statement credits or used to purchase gift cards and merchandise. The Blue Cash Everyday® Card does charge a foreign transaction fee, doesn’t offer bonus earnings on travel purchases, and rewards can’t be redeemed for travel, so the card is not a match for frequent travelers. Hot Tip: If you’re a frequent traveler, we recommend a card like the Chase Sapphire Preferred® that has no foreign transaction fee’s. A solid no annual fee starter credit card for the traveler because it has no foreign transaction fees and travel purchases can be erased with the miles earned on the card. Simple to earn and easy to redeem, cardholders don’t have to keep track of special bonus categories or quarterly promotions. New cardholders can also benefit from the 12-month 0% APR period for purchases that allows you to spread out the repayment without interest charges. Earn 1.25 miles for each dollar spent on the card, every day, on every purchase you make. It’s a simple but consistent earning plan. Capital One miles can be redeemed for statement credits to offset travel purchases. Find the best deal on any airline or at any hotel and charge it with your Capital One VentureOne® Rewards Card. You’ll then be able to wipe out the charge with your Capital One miles at the value of 1 cent per point for up to 90 days after the purchase. You can also use your miles to purchase travel with the Capital One Redemption Center. The Capital One VentureOne® Rewards Card is a good choice if you want simple earnings, can use the no interest period, and you like to travel – find out more about its perks here. Hot Tip: Capital One has a user-friendly pre-qualifying process that will let you know up front if you’re likely to qualify for one of their credit cards. You can complete and submit the risk-free quick form here. No credit score will be pulled. Earning and redeeming credit card rewards can make your family’s dream trip come true. Image courtesy of Shutterstock. With all the different types of rewards and even more ways to redeem them, it may seem overwhelming. Here’s a sampling of some sample redemptions using the most popular rewards, Chase Ultimate Rewards Points, American Express Membership Rewards Points, and cash-back rewards. Ultimate Rewards redeemed via premium Chase credit cards are valuable because they can be transferred to airline or hotel partners or redeemed for travel on the Chase travel portal. You could fly the whole family to Disney World for just 66,772 Ultimate Rewards points. When points are transferred to premium Chase credit cards such as the Chase Sapphire Preferred or Chase Sapphire Reserve, they become worth 25 to 50% more. The example above is redeeming Ultimate Rewards Points with the Chase Sapphire Reserve. 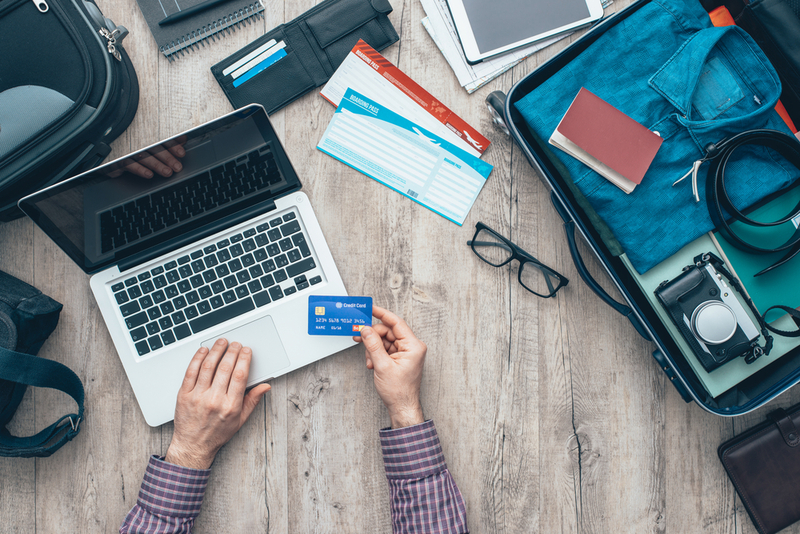 To learn even more ways to redeem Ultimate Rewards Points using the Chase travel portal, check out our ultimate guide. Hot Tip: For more info on doing Disney on the cheap, check out our article – How to Visit Disney World for Cheap by Using Points & Miles. American Express Membership Rewards points earned on American Express cards such as the Card can be transferred to airline partners where they are converted into miles that can be redeemed for award flights. Membership Rewards points can also be redeemed for travel on American Express Travel. Use your Membership Rewards points to fly in style in Virgin Atlantic Upper Class. Image courtesy of virgin-atlantic.com. For a truly posh experience, transfer your Membership Rewards points to Singapore Airline’s KrisFlyer program and redeem for a business-class flight from the U.S. to Europe in Virgin Atlantic’s Upper Class Cabin. The experience will cost you 50,000 miles each way to enjoy the comfortable all-aisle seating, on-board bar, and the opportunity to hang out in the high-end Virgin Atlantic Club House Lounge before your flight to enjoy a meal and cocktails. To learn more about how to redeem Membership Rewards Points for the best value, read our guide with plenty of redemption ideas you’ll want to try. While earning cash-back on your rewards credit card is the most flexible form of rewards, these funds can disappear quickly if you don’t have a plan to harvest those funds to use towards your travel goals. Credit cards handle cash-back rewards differently. Here are some tips to be proactive in each scenario and make sure the cash-back ends up where you want it. Some cards apply cash-back automatically to your statement balance. When this happens, it’s easy to see that cash be absorbed and not accumulate. To make sure the cash-back is contributing to your travel goals, buy gift cards in the amount of the cash-back just before the statement credit hits, and you’ll have the value of these gift cards saved toward your travel goal. For example, if you’ve earned $25 in cash-back this month, purchase a gift card in that amount. Depending on your travel goals, the gift card might be for Disney, gas, an airline, dining, or hotel. It’s easier to realize the value of cash-back when it accumulates in your account, but the gift card trick can work in this scenario too. When your cash-back balance reaches a pre-determined level, purchase a gift card with your credit card that you can use towards your travel goal and then request a statement credit to cover the cost. When one of the cash-back redemption options is to receive a check or a transfer to your bank account, you can save for your travel goal by opening a separate bank account just for travel and have the cash-back deposited in that account. Hot Tip: If you’re saving for a family vacation, include everyone in the process of purchasing and keeping track of the travel gift cards or monitoring the special travel savings account until you reach your travel fund goal. No worries if your credit is less than perfect, because as you work to rebuild your credit, you may still qualify for a rewards-earning credit card. In fact, a credit card can help you improve your credit score when it’s managed wisely. The Discover It Secured Credit Card comes with all the benefits of a regular cash-back credit card, and best of all, you can qualify even with poor credit. Chase issues some of the best first credit cards for rewards and cash-back. However, the unwritten Chase 5/24 rule, confirmed through data points from actual credit card applicants, infers that you won’t be approved for one of their credit cards if you have opened 5 or more total credit cards from any issuer in the past 24 months. To learn more about the rule and how it affects your card approvals, read our expert overview of the 5/24 rule. For more information on how your credit score works, what determines a good or bad credit score, and tips for keeping your credit information safe, check out our expert guides. You can also check out our collection of credit card recommendations for bad credit that can help you get back on the path to qualifying for some of the best rewards-earning credit cards. Additionally, many credit card issuers offer a way to see if you might qualify for their credit cards by completing a quick pre-qualification form. You’ll find all the information you need to pre-qualify in our complete guide to credit card pre-qualification. Another helpful risk-free option that lets you know if you have any targeted credit card offers is the Card Match Tool. It’s a lot to take in, but by now you should be a step closer to securing the best starter credit cards and earning rewards. Choose well, always pay your balance off in full each statement period, make your payments on time, and use your rewards wisely. We also have a post dedicated to the best travel rewards cards for any type of traveler, from the luxury international traveler to the budget traveler or the family road trippers and everyone in between. A dear friend of mine frequently points out that credit is your most important asset. Those are wise words and a reminder to treat credit with respect, and it will serve you well. I think it could serve me well with some Caribbean time on points and miles this winter. What is the best credit card to start with? The best first rewards credit card to start with is the one that matches your spending habits, travel and lifestyle goals, and your financial situation. This is because you’ll want to maximize the rewards you’ll earn, be able to use those rewards to realize your goals, and of course, be able to pay off your balance in full each month. For example, one of the most popular credit cards for beginners who spend on travel and dining is the Chase Sapphire Preferred because it earns valuable Ultimate Rewards Points on those purchases. If you don’t spend a lot on travel and dining, you’ll want an alternate starter card that matches the purchases on which you spent the most. Which credit card is easiest to get? One of the easiest credit cards to get is a store-branded credit card that you might apply for when checking out at your favorite retail store. Store-branded credit cards target customers with only fair or better credit scores, so you’re more likely to get approved. The positive aspect of a store-branded credit card is that if managed well, it can improve your credit score, you most likely will not have to pay an annual fee, and most store-branded cards offer the ability to earn rewards. The other option for easily securing a credit card is a secured credit card. You will need a security deposit to qualify, but getting a secured card is an easy way to start building credit. What credit cards can I get with no credit? The best rewards-earning credit cards, even starter credit cards, require good to excellent credit. A good place to start if you have no credit would be a secured credit card. This is because you can qualify for a secured credit card without any previous credit and you’ll be building a positive credit history with responsible activity on the card. You will need a security deposit to qualify for a secured credit card, but after making on-time payments for a specified period of time, some issuers return that security deposit or upgrade you to a card that doesn’t require one. Before you apply for a secured credit card, you might want to see if you have already been targeted for a credit card offer. You can access this information risk free with the Card Match Tool. You could also check for pre-qualified offers. Chances are, with no credit history, there will not be any offers, but using the Card Match Tool or checking for pre-qualified offers does not affect your credit score, so it’s worth the minimal effort. How can you establish credit for the first time? One of the fastest ways to start building credit is to become an authorized user on another person’s credit card. If you have someone who has the confidence in you to do that, it might be a path to consider. You’ll want to make sure the credit card reports authorized user activity to credit bureaus. Another good option to start building credit is to obtain a secured credit card. Secured credit cards require a security deposit, but are a good way to establish a positive payment history and start building credit. Does applying for a credit card hurt my credit score? When you apply for a credit card, your credit score may drop initially. Depending on the state of other factors that make up your credit score, it can recover quickly. However, if you have a short credit history, you don’t want to open too many new credit card accounts too fast. Several factors go into making up your credit score and you may not have adequately developed those factors yet. For example, length of credit is a factor considered.